Our team will attend the IEEE Vis conference (Berlin, 21-26 October 2018). We will show the “Voronoi projection,” a map projection method designed and developed by Philippe Rivière. Here’s a short intro video (25 s). This projection is available as an interactive web page that allows to explore the principle, and as a node.js application in order to build the more demanding maps on one’s own computer — a few minutes of computation might be necessary for maps with a few hundred thousand faces. These images can be used as a pedagogical tool as they allow – as Jarke J. van Wijk puts it for the myriahedral projections, a predecessor to our work – to “visualise, just like the Tissot indicatrix, the distortion that occurs when a non-interrupted map is used, and can be used to explain the basic problem of map projection”. We also made original paper toys representing the Earth, which a user can then cut, fold, and glue back into a quasi-spherical shape, evidencing the sometimes huge distorsions created by the gnomonic face projection. This projection can also be purposed as a way to visualize a spherical minimal spanning tree as the solution of a constraint system. Beyond its artistic and pedagogical aspects, this projection has made it possible to develop and improve some of the geographical modules of the D3.js library, especially d3-geo-polygon and d3-geo-voronoi. The first module allows you to create maps with a polygon of your choice as the edge, and to calculate the corresponding intersections and surface interpolations. The second module proposes standard methods of triangulation and search for close neighbours (Delaunay) and tesselation (Voronoi), based on a fast algorithm that we have adapted for spherical coordinates (longitude, latitude). This allows, among other things, to produce analyses and maps from a topological approach: the usual point clouds can thus be converted into surfaces and graphs connecting neighbouring points, and this on a global scale if desired. 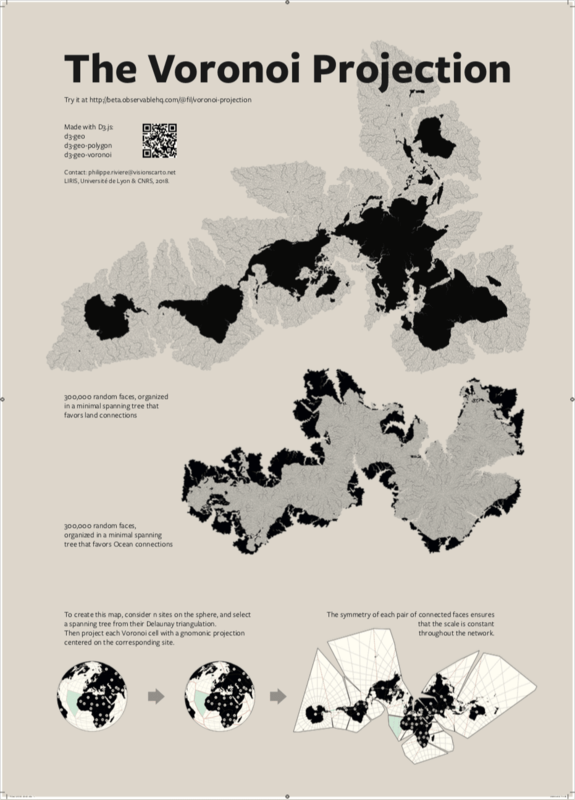 Our poster shows two maps of the world created with this system, one favouring emerged lands, the other focussing on the oceans. The operating principle, schematized at the bottom of the poster, is detailed in the poster abstract that you can download below.